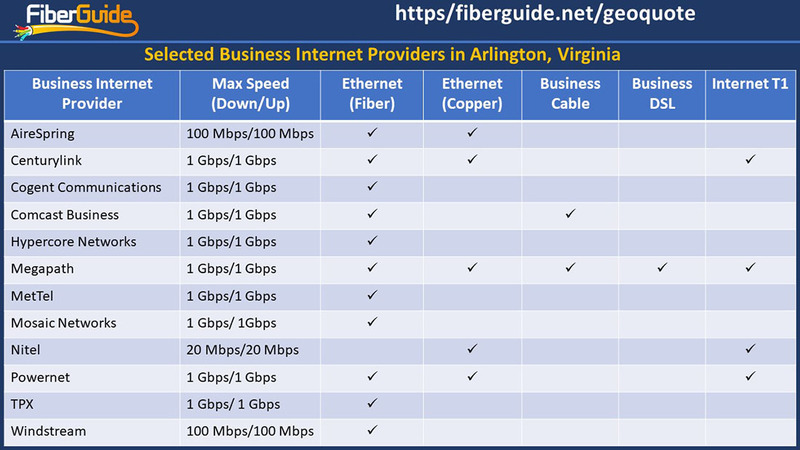 There are over 30 business Internet providers in Arlington, Virginia. They include large carriers, such as Comcast Business and Centurylink, with their own backbone and access (or last mile) network infrastructure. Smaller providers do not own run on the networks of larger carriers. Business Internet providers also range in size by coverage – from hundreds to hundreds of millions of people covered nationally. Business Internet providers in Arlington, Virginia, offer a variety of Internet access technologies. Wireline Internet access technologies range from Internet T1 lines with typical symmetric download speed of 1.5 Mbps to symmetric Ethernet over fiber services at 1 Gbps. A number of theses providers have the capacity to deliver up to 100 Gbps to large enterprises in some locations of Arlington, Virginia. They offer one or more of the Internet services detailed later. For example, Comcast Business offers business cable at 1 Gbps download and 35 Mbps upload and also Ethernet over fiber at 1 Gbps download and 1 Gbps upload. Internet T1 – transmitted through twisted copper pairs, optical fiber and other media, this Time Division Multiplexed (TDM) service has been around since the 1960s. Although typical speed is 1.5 Mbps, it typically comes with guaranteed bandwidth and Quality of Service (QoS). Unlike “best effort” broadband services, the T1 service is dedicated to a customer and is not shared with others in the neighborhood. Some small businesses use T1 lines for both data and voice while others may choose to dedicate T1 lines to high quality voice services and use broadband services for data. Business Cable (Hybrid Fiber Co-axial) – is readily available in most households and businesses in Arlington and is relatively inexpensive. Bandwidth is typically asymmetric, with lower upload than download speed. Business cable Internet may be offered as “best effort” business broadband and may not come with guaranteed QoS. Check with the provider or make your query through GeoQuote to find out if QoS guarantees can be provided. Business DSL – Like Internet T1, DSL (Digital Subscriber Line) is delivered through your twisted copper pair. Most homes or businesses with a copper phone line can be provisioned with DSL service. DSL may or may not come with guaranteed speed and QoS and the onus is on the subscriber to ensure that QoS can be guaranteed if needed. In many cases, DSL is also offered as an asymmetric service or ADSL. Ethernet – Business Internet providers in Arlington, Virginia, who offer Ethernet access typically provision it over twisted pair copper or optical fiber. With very low cost/bit, Ethernet is increasingly becoming the service of choice for business Internet access and other Wide Area Networking (WAN) applications. Moreover, Ethernet can come with guaranteed bandwidth and QoS. Most enterprises now use Ethernet to replace TDM services such as T1 and SONET in their WAN networks. The only caveat is that Ethernet services are not as readily available as T1s and cable and significant upfront costs may be incurred to connect a building to the nearest Ethernet point of presence. Use GeoQuote to find out if there is already Ethernet service in your building or the nearest point of presence to connect your building. PON (Passive Optical Network) – PON is the technology used by providers such as Verizon to deploy fiber access networks to homes and businesses. The cost of PON services, such as Verizon FIOS have significantly been reduced over time. However, for guaranteed speed and QoS or FIOS dedicated line, prices are significantly higher. Through GeoQuote, a one stop carrier services research tool, FiberGuide can help you research providers, their plans and budgetary pricing. By running GeoQuote, you may be able to instantly display service plans available in your area, including budgetary pricing. For more complex services a FiberGuide agent will work with you to identify the best provider based on your technical requirements and budgeting. In addition to narrowing down your options and providing you with guaranteed best pricing, FiberGuide will also work with you through provisioning and beyond implementation. In other words, in addition to having a direct relationship with the carrier, FiberGuide will remain as an ongoing resource to help you with any questions or issues you may have with your selected carrier, as well as provide you with support. We specialize in business Internet access and other WAN services including T1 lines, Ethernet over copper, Ethernet over fiber, Ethernet Virtual Private Lines (EVPLs), SD-WAN, International VPLS, network monitoring and other carrier services. For complex solutions, such as multi-site connectivity, we also offer free pre-sales technical support.